My memories of Smallthorne are as old and as vivid as my memories of Bradeley, the village where I was born and grew up. 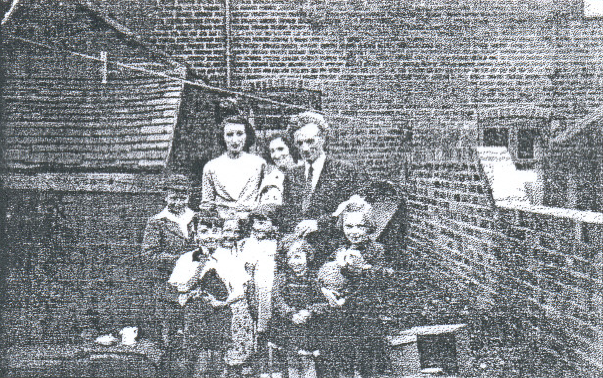 Smallthorne was the home of many family members. Each of them holds a special place in my memory and some a special place in my heart. So, Smallthorne was never anything other than a second home really and it still feels the same today, though I have lived in several other places. 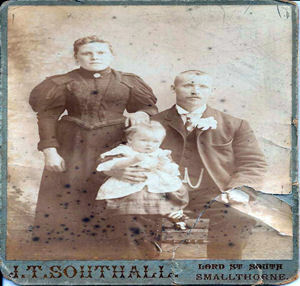 My maternal grandparents lived in Smallthorne, so even as a baby I would have been there often I’m sure. 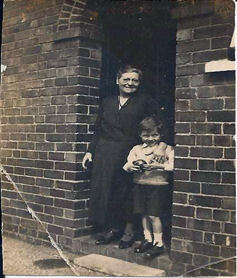 My grandparents Joseph and Gertrude Wooldridge lived in Robert Heath Street. I recall many happy hours in the playground at the end of their street; I was one of the younger family members compared to many of my cousins and I recall Granddad crossing us over the road and forbidding me to come back across the road without either him or one of the much bigger cousins. We had many family gatherings at my Grandparents’ home. On a Saturday morning, every third one, (I had two older sisters, we took it in turns) I had to go to Grandma’s house and do errands for her, a crusty tin loaf from the baker, a custard tart with no brown bits on and Granddads black twist tobacco from the cobblers. I loved the smell of that tobacco and watching Granddad carve and shred it up and stuff it into his pipe. Woe betide us if we got anything wrong with Grandmas shopping, she’d send us straight back to sort it out! We needed to be able to work out the change we were supposed to have too. Grandma was very strict but my memories are mostly warm. I recall that there was a soldiers uniform in the cupboard on the landing at my grandparents’ home and even though I was very small I always attached a sense of sadness to it, though I didn’t really understand who or what it was and why it was kept there. As I grew old enough I became aware that my mother’s brother had been killed in action and that this was his uniform, he was only 20 years old, so many families have stories such as this I know. 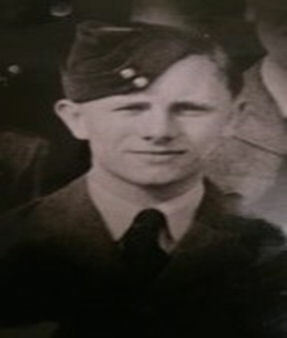 Even now Mum will always say when it is his birthday and how old he would have been, though we never met him he is as much a family member as those we did meet. Mum has made sure that we remembered him with her own memories, which now we are older, we are extremely proud of. Mum and I have attended St Saviour’s church on Remembrance Day for as long as I can remember, and when mum can no longer attend I will carry on, in remembrance of my Uncle, my families’ loss and all the other souls that were lost. On a Sunday morning after Sunday school Dad would walk all of us (me and my three siblings) across Bradeley Lane and into Smallthorne where we’d pay brief visits to our extended family. I recall Jessie’s wool shop on the corner which to me was the ending of Bradeley and the start of Smallthorne, inside the shop there were shelves and shelves of brightly coloured wool and always something that had been knitted in the window. We only ever had one set of Grandparents that we knew. Dad’s mother had died in child birth and his father died whilst he was still a young boy. As I’ve grown older I’ve realised more fully what an impact that would have had on my lovely dad and his remarkable family. Great Grandma Price centre, my Grandmother whom I never knew immediately behind her. 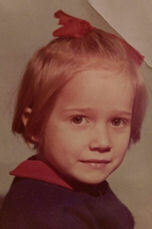 As children however we had Aunts that were really great aunts and some of them really were great! These were the ladies Dad had been raised with when his mother died. Their characters were very different and I recall them all…. They took care of my dad and I can’t imagine what it would have felt like to his Grandmother who must have had a heart of sheer gold and the strength of an ox to cope with losing a daughter at the very same time as having the responsibility of raising a baby when her own were already grown. You can only take on a very small part of that when you are an adult yourself, and have known the joys of being a mother and grandmother. Great Grandma Price holding my Dad. Although we children didn’t meet many of those family members their love to my dad filtered through to us and touched us deeply in the care, love and sense of fun and strength we were shown throughout our childhood. 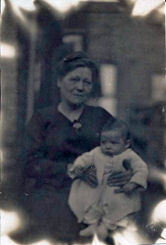 Great Grandma Price with Dad, growing up. As a mother and grandmother myself I look at this picture and others similar and see that dad was well dressed and obviously well-loved which is of great comfort to me, though the situation would have been financially and emotional difficult I’m sure. School was great, I did gymnastics, orchestra, ran for the county, had a main part in the school play and I enjoyed it all; this was the land of team points and gaining privileges. Sometimes we were allowed out of school at lunch time and we’d visit the shop on Athlone street, Mrs Hargreaves served us whirly gigs, white mice, lumps of pink bubble gum and sherbet pips and sometimes she had made her own ice lollies in the shape of ice cream tubs, they always broke off the sticks when you had eaten only half. I recall being a brownie too in Smallthorne, we had a brown dress with a yellow type tie and a shiny badge to hold it in place, I wanted to be a Girl Guide really but I wasn’t old enough but I liked the navy dress so much more. I wanted to join the scouts too but a girl couldn’t back then, they seemed to do really fun stuff much more so than the brownies! I could already weave, knit and sew, what I really wanted was a pen knife with all the folding out bits on. Another early memory of Smallthorne was waiting for Santa Claus to come with his sleigh across the top and down into Hanley. I recall ice cold feet but all worthwhile because this was the real Santa I knew this for sure as I went to see him in Lewis’s and he gave me a present, I looked into his eyes and yes this was the real, real Santa!! My friend and I used to go to Smallthorne to wash and dry her families washing in the laundrette; it was always warm in there and the washing smelled so lovely when we were folding it. I recall one time we accidently washed one of those nylon stringy net type bags and it came out of the wash the size of a Cindy dolls bag, that washing was difficult to carry back along the lane! We would have looked a sight I’m sure and goodness knows what the washing was like! Mum had a twin tub in our kitchen; she would drag it out from under the work unit when she needed it. We also had a kitchen cabinet with a drop down part which served as a little table but you couldn’t use this on washing days the kitchen was too small. As I’ve got older I realise how important that network of family and values was and is in our interaction with each other and in facing life’s challenges. You understand more the hardship and tragedy that is within your family and has been endured by people you love and people you would have loved to love had you have had the honour of meeting them. They have played a part in not only your ancestry but in the places you have known as home and to your strength and personality. Mum is still in Smallthorne, she’s only ever lived in Smallthorne or Bradeley, she knows many generations of families and has very many beautiful memories of her own which she shares often, from a young girl to an elderly lady she is proud to have been born and bred in Smallthorne she has no intentions of being anywhere else. When mum celebrated her 80th birthday a few years back, I held a party for her in Wooldridge court, Wooldridge court holds a proud memory for Mum and her family as it was named so after her father, my Granddad. 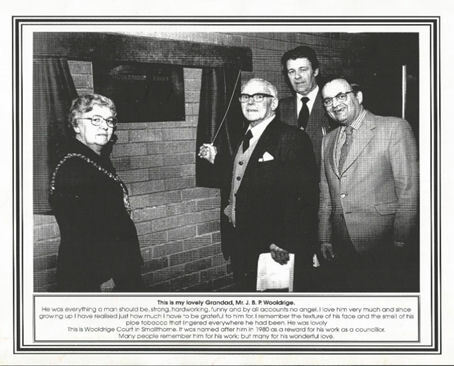 Granddad had been a councillor for some years and this was an honour for him as he retired. 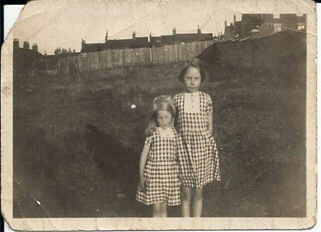 Granddad had three girls and two boys, Marion, Lilian and Muriel, Wilfred and Howard, my mum is Lilian. Marion, the eldest of the daughters actually lived in Wooldridge court for a number of years, something which Granddad would have liked but probably never thought would happen. When it was opened Marion would have been a women in her prime, this serves to remind us that things we do today, now, will serve the community long after that and probably those we love too. There is a seat in memory of my Grandmother on the balcony of Wooldridge Court and it would be fair to say that most of the family members have at some time sat there chatting sharing memories and watching Smallthorne folk below dashing about community drive in their everyday lives. 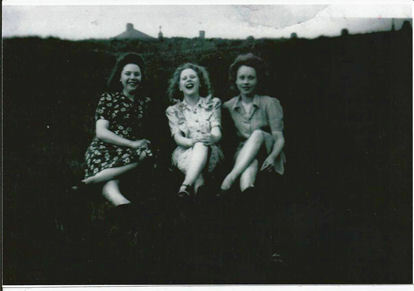 Having the Smallthorne site is amazing and has enabled many to relive special memories and to record them for future generations. Though many memories are personal, whether happy or sometimes sad they serve to demonstrate values of the day, the way we lived and worked and without those records much will be lost, not just to our own family lines but to our community. Communities have changed so much in my life time, values have changed, both family life and work life are very different now. I always think, it’s not what happens to you in life which makes or breaks you, but what you do with life’s experiences that makes the difference, but it’s the sharing of them too which bonds communities, develops understanding and enriches future generations. 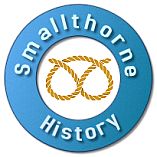 There’s a lot to be proud of in Smallthorne, keeping it alive is a privilege to be part of.